One of the Common Core Standards for Mathematical Practice, or SMP, is “Reason abstractly and quantitatively.” This mouthful refers to the idea that mathematical symbols have meaning, and that students should strive to keep that meaning in mind as they work. For example, a class full of second graders can discuss how many muffins are in the partially filled muffin tin in the figure. How many muffins? How did you count them? Some of these second graders will count the muffins one by one. Others will see more sophisticated relationships. The teacher may help students record their thinking using arithmetic. Can you see how each of these expressions correctly counts the muffins? What could the child who wrote this expression have been thinking? When you (or a second grader) are working on a task such as this one, you’re playing with math. You’re imagining new relationships, trying something without fear of getting it wrong, and seeing a small corner of the world in new ways. Children do all these things when they play. There is no one answer involved when you ask, “How can you count these muffins?” — all of the ways of counting come up with seven muffins. That leaves you free to play with the ideas and see whether you can see what someone else sees in this situation. 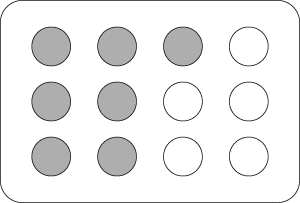 As far as the Common Core SMP is concerned, you probably found yourself going back and forth between the symbols (3 x 3) and the meaning (Where can you find 3 groups of 3 in this picture?). This is the heart of “Reasoning abstractly and quantitatively” — moving between the context (counting the muffins) and the abstract ideas (3 x 3 – 2).